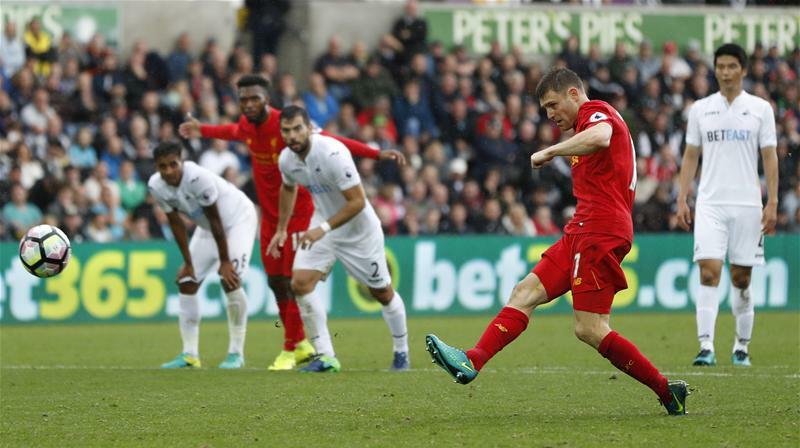 Roberto Firmino and James Milner netted in a rejuvenated second-half as Liverpool overcame a game Swansea for their fourth straight league win. 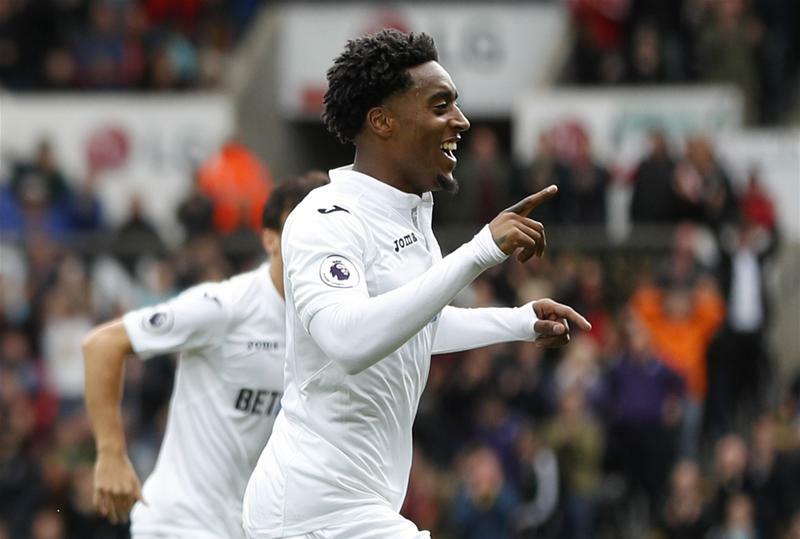 The Swans broke in front in the first half as Leroy Fer guided in an open goal, leaving the Reds frustrated, also losing Lallana to injury in the first 45. 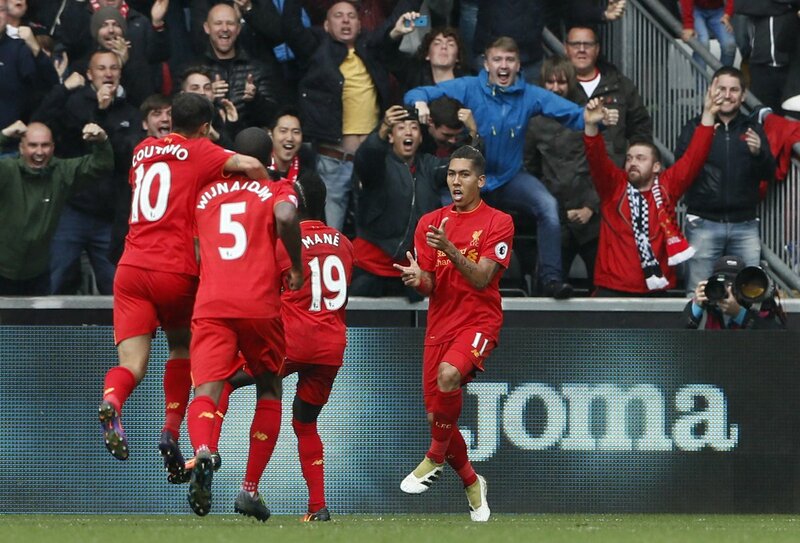 But they ended strongly, and after the interval were a new side - with Firmino heading into the corner after Henderson's ball over the top, before the Brazilian was fouled in the area later on for James Milner to sweep home the penalty. Brimming with confidence after a hot streak of form, the visitors looked to take early control by snatching a wealth of possession. Unfortunately for them on a wet morning in Wales, little could be done with it, and it was instead Francesco Guidolin's side who put the first key attempt on the board as Borja González headed over the bar. The Reds still hadn't fully woken up and would pay a dear price for doing so. Gylfi Sigurðsson's corner from the left flank caused all sorts of problems as Borja knocked it back towards the danger zone from beyond the far post. Mike van der Hoorn was on tap to prod it past the goalkeeper (with an apparent Lovren touch in there rebutting the offside claims) setting up Leroy Fer to bundle in the open goal. Another setback after 20 minutes of play didn't help Liverpool shake off the cobwebs, as Adam Lallana eventually gave in to a groin injury caused by a Leon Britton challenge. Daniel Sturridge replaced him but would cut a frustrated figure in his early spells, just offside when through and passes being played slightly far in front of him. Swansea, meanwhile, continuously gave their supporters something to smile about - long overdue, as Karius stopped Cork's tame effort. Then, from point-blank range, another Sigurðsson delivery exposed the set-piece weakness of the Merseyside contingent, as Borja's header fizzed off target. 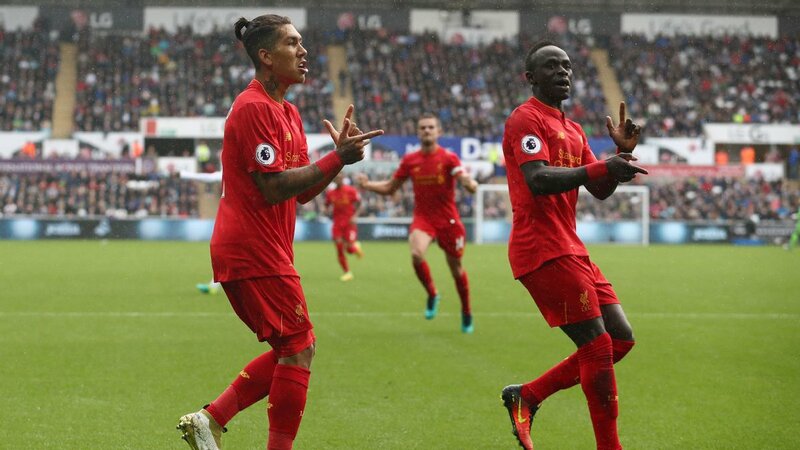 Sadio Mané did provide some sparks as the game progressed, causing chaos in the area as he wriggled his way around defenders with the Swans cautious of giving away a penalty. There was an appeal, albeit a light one as Michael Oliver quickly shot down the Senegalese star's appeal. Desperation continued with Sturridge looking for a penalty later in the half, instead receiving a booking for simulation. The visitors did find themselves getting more active in the attacking department, but they were yet to truly test the metal of their opponents after 35 minutes. Liverpool's firepower were receiving a ton of touches as the first half began to wind down, with Firmino then getting a pop but thwarted, after Amat denied Mané's shot with an incredible tackle. Swansea once again gave them something to worry about as Karius just about dealt with Sigurðsson's menacing free-kick, but they had their eyes fixed on the clock, narrowly managing to go into the interval with their one-goal lead preserved. Heavy rain on the Welsh coast was a reflection of what the hosts were receiving in terms of the game, as Liverpool came racing out of the blocks to start the second half. Some neat combination work between Sturridge and Mané was hesitatingly cleared while the Englishman almost got on the end of Clyne's cross. 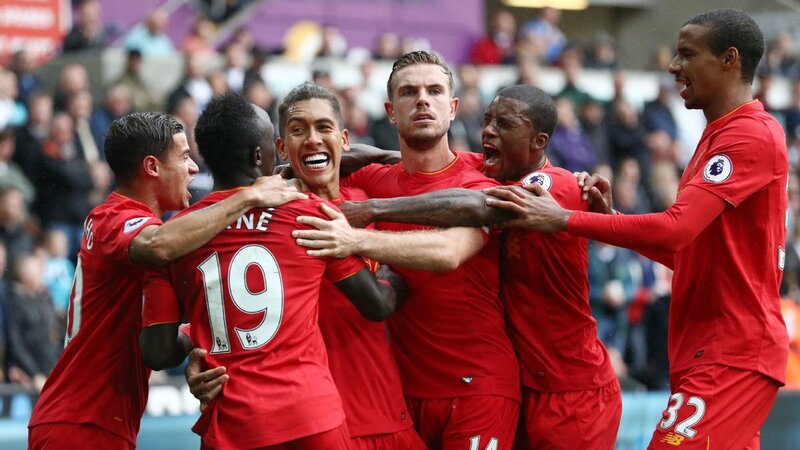 As the minutes wore on, they continued to knock on the door, with Coutinho lining up too as his long-range shot was stopped by Fabiański. That door would be pried open on the 54th minute at the hands of Roberto Firmino. Philippe Coutinho's free-kick came off the wall and fell to Henderson, who saw a gap and popped the ball over to the Brazilian, through on goal and with time to spare, heading it into the low corner. Wave after wave, the red shirts continued to swarm forwards and Swansea were continuously under the cosh. Sturridge almost flicked on a cross, while Coutinho probed again - with over an hour passed all the wind was behind the sails of the visitors who had taken complete control, now in search for the lead. Mané was then once again denied, this time by a block from Norton after Milner robbed the defender down the left wing. 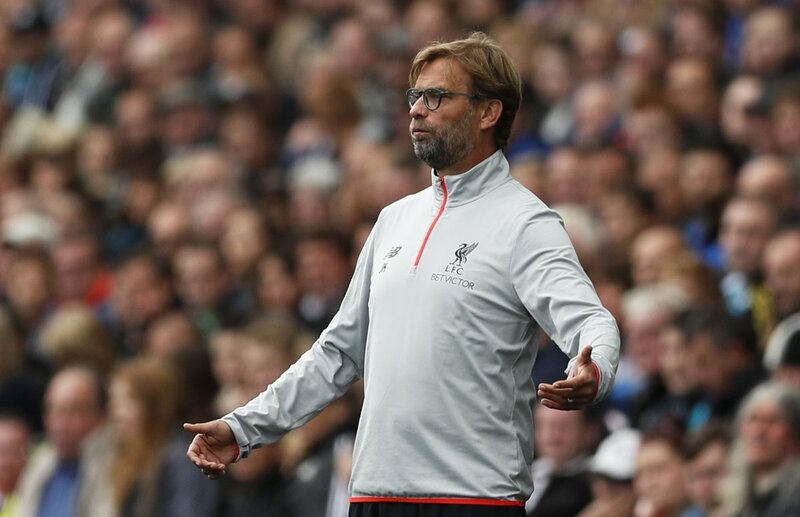 A theme continued to develop as the game approached its final minutes - Liverpool were hunting, Swansea were in survival mode. It would all hinge on one moment in the area, where Roberto Firmino pulled the trigger for a shot but instead was felled by Àngel Rangel. The Spaniard clumsily cut across him mid-shot sending him to the ground, and providing James Milner an opportunity from the spot in which he fired centrally, putting Liverpool in front. The Swans did all they could to grab a point late on, but the efforts were not enough. Swansea were put in trouble suffering another loss, while Liverpool had overcome a blip to march onwards and upwards.